Renewing your CXR membership is very easy. We use the PayPal service for processing your payment. If you don't already have a PayPal account, don't worry, as Paypal can also handle a credit card payment. (You'll find these links on the left margin of this page). Once there, look up your name and you should see a RENEW link on the right side of your information. Clicking this link will take you through the process, with helpful, step by step instructions. If you don't see a RENEW link, this means that your local affiliate wishes you to renew through them directly, so please contact your local official. Norman CC Annual Tnmt. 2019 Norman OK 4/20/2019	 4/20/2019	 Tnmt. A-State Chess Championship Jonesboro AR 4/20/2019	 4/20/2019	 Tnmt. NCC Annual Tnmt. - 2019 Norman OK 4/20/2019	 4/20/2019	 Tnmt. Sunday Rapid 17 Clovis CA 4/14/2019	 4/14/2019	 Tnmt. Sunday Rapid 16 Clovis CA 4/7/2019	 4/7/2019	 Tnmt. Woodall K-12 Schol. 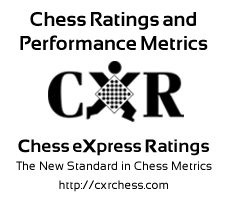 Chess Open Tahlequah OK 4/6/2019	 4/6/2019	 Tnmt. Midwest Jr. Championship Liberty MO 4/6/2019	 4/6/2019	 Tnmt. Friday Nights Free Entry Cash Liberty MO 4/5/2019	 4/26/2019	 Tnmt. 青苗 Changde HN 4/3/2019	 4/4/2019	 Tnmt. TEST TEST TEST Westerchesterfield MA 4/1/2019	 4/1/2019	 Tnmt. Sunday Rapid 15 Clovis CA 3/31/2019	 3/31/2019	 Tnmt. Yukon K-12 Open Yukon OK 3/30/2019	 3/30/2019	 Tnmt.